Recently, while listening to a podcast about abortion, a sickening thought popped into my head: what if my obstetrician concealed the fact that my fetus, who became Calvin, was missing some—perhaps most—of the white matter in his brain? Michael and I didn't learn of the grave anomaly until a follow-up sonogram when I was thirty-two weeks along. I remember a Boston specialist's surprise that the malformation hadn't presented in one of my earlier sonograms from Maine. It was her opinion it should have. Thinking back, I wonder if it had without us knowing. With news on abortion trending, I relive the events of my two pregnancies. I revisit the initial weeks of my first one, and the dreaded feeling at seven weeks that I wasn't pregnant anymore. I remember the sonogram revealing there was no fetal heartbeat—confirming my suspicion—and the gut-wrenching decision to wait for my body to expel the miscarried fetus or to undergo dilation and curettage. I then recall my OBGYN moving her practice out of town and, when I got pregnant again, asking friends to recommend a new one. I relive the first few visits to see the new doctor, my request for a CVS test to check for genetic abnormalities early on, her resistance to assent, followed by her comment that if we found something terribly wrong with the fetus we would be "hard-pressed" to find a local doctor to provide an abortion, asserting her refusal to perform the procedure herself. She offered no further discussion on the topic, no counseling, no support, no understanding, no offer to refer if needed. In my and Michael's minds, she was negligent and indifferent. 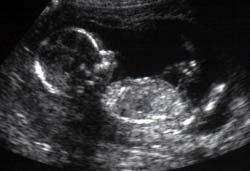 In the end, a sonogram proved my pregnancy was in its thirteenth week, too far along to undergo the test. In revisiting these moments from over fifteen years ago, I wonder if my obstetrician secretly knew early on—though concealed it because of her religious beliefs—that Calvin was missing as much as 80% of the white matter in his brain, a percentage that one pediatric neurologist cited after having studied my fetal MRI and sonograms. He later told us our child might never crawl, walk or talk. He never mentioned severe visual impairments or uncontrolled seizures as possibilities. If Michael and I had known early on of Calvin's malformed brain, and had we known the dreadful extent to which it might impact his well-being and quality of life, his development, cognition, coordination, communication, vision, ability to move about and function independently, and his increased odds of having unstoppable seizures, or of being abused by caregivers, would we have chosen to terminate my pregnancy? I really can't say. But one thing I do know with certainty: it is torturous to see Calvin suffer on a daily basis, to see him seize repeatedly, sometimes for several consecutive days, bite his cheek so bad it bleeds, see terror in his eyes and malaise on his face, be a veritable guinea pig for neurologists and me, endure the miseries of antiepileptic drugs and their heinous side effects, to see him hurt so needlessly. Especially during rough stints, it's hard not to imagine how life might have been—perhaps easier, calmer, happier, less restricted, less anxious, less heartbreaking—if Calvin had never come into this world. I find myself resentful of still having to spoon-feed him and change his diaper after fifteen years. I get frustrated by the fact he can't do the simplest of things. I'm chronically sleep deprived from his frequent awakenings. One moment I lament his existence and the next I wonder what I would do without him. And though Calvin brings me immense joy at times, and though he is as precious to me as any mother's child could be, our lives have been profoundly strained by his existence. All three of us suffer, but none more than our sweet Calvin. Life with him, worrying about and watching him endure his maladies—despite, or perhaps owing to, the fact I love him immeasurably—is such a painful and burdensome endeavor that at times I regret ever deciding to have a child. I’ll be honest. This week’s news cycle has been exhausting and painful. This picture is me, taken the night before I terminated my pregnancy. My head is bowed and my hair covers my face, so what you don’t see is the grief, my face and eyes swollen from days of no sleep and constant weeping. After days of research and google and doctors visits and soul wrenching conversations with my husband about whether we would bring our son into this world knowing he would not survive. Women are not waiting until the third trimester and saying “oops, I changed my mind.” They have little outfits in drawers, maybe even have the nursery set up, they have picked out names. And then they’re having their hearts broken after discovering their baby will not come home. Please be kind. Please read our stories. Please research before you post. None of these situations nor the feelings they induce are easy. There's no black and white, cut and dried logic to apply when pregnant women are faced with these dour choices. Panels of men in suits and ties meeting behind closed doors should not be deciding pregnant women's fate. Sometimes the most intimate and hopeful situations sour. That is when understanding and empathy come in, not hyperbolic, false propaganda and political posturing by men in positions of power who'll never be pregnant. We need to listen to women's stories and trust them to make the best well-informed choices they can when their lives turn upside down. To imagine again that someone—a stranger to me—could have decided my fate and the fate of my family in such an intimate and tragic matter is chilling, dystopian, really. With the future of Roe vs. Wade now in jeopardy, and access to safe, legal abortion becoming harder in many states due to anti-choice efforts, our mothers, daughters, sisters, wives and partners are facing similar peril, when what they need most is love, understanding, support, and the ability to make their own choices. Sending bundles and bundles of love to you beautiful momma. Your courage, fortitude, fierce love and pragmatism inspire me greatly on my own walk as a mother of an epileptic son. I face similar questions in the middle of the night... you are not alone. Thank you for your heartfelt honesty. It's so vital that women maintain choice.